Modifications/Clarifications begining with a number in the format "n.n" ie. (1.9) are by the designer other entries are followed by the initials of the submitter. 1) When connecting the fairing, you have to trim an additional piece off the lip of the fairing so it clears the brackets. Without this trim, the fairing will not seat on the axel. 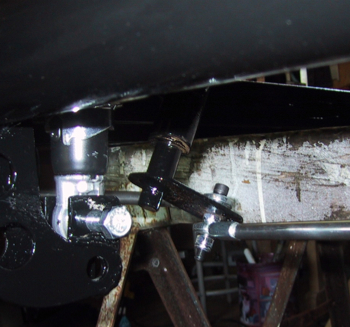 2) I purchased some tractor seat supports and mounted the seat on them. 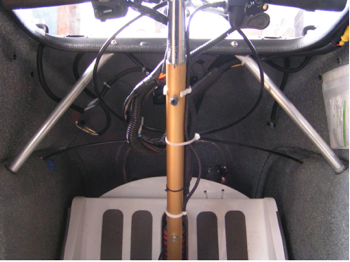 (U shaped with adjustable slots) They provide suspension and height, and are adjustable. 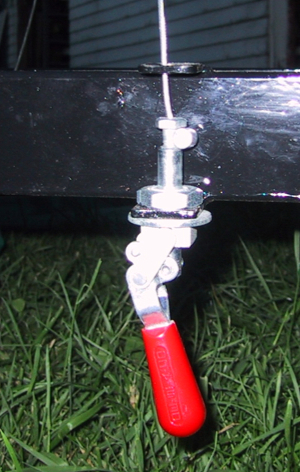 3) I used an aluminum angle and created a chain tensioner that connects to the rear axel. It works perfectly to keep the chain tight, much like a motorcycle. 4) I used copper pipe straps and attached a standard motorcycle license plate holder to the rear light which hangs from the straps. The strap holds the wiring as well. 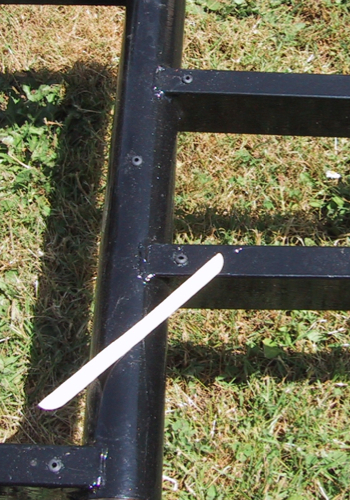 5) I used rubber piano tuning wedges as spacers for the fairing. They provide good support and height. 6) I used only one signal switch on the handlebar brakes by stretching one spring. This simplified the wiring. 7) I felt it was impossible to properly seat the canopy using Velcro. I used nuts and bolts alone, and it is very easy to remove. 8) The battery box is too small to hold standard batteries due to the mounting lip at the base of the battery. The only batteries I found that will fit are Optimas, a disadvantage if you want to minimize battery cost. 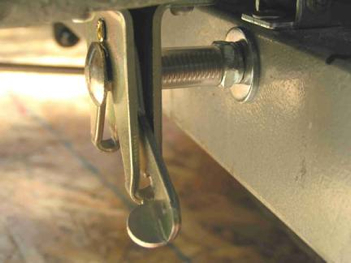 Re: (CW 10/23/07) Be sure you adjust the steering tie rods with a little "toe in" as described in the Assembly Manual. Always adjust the wheel alignment with the weight of the batteries installed. 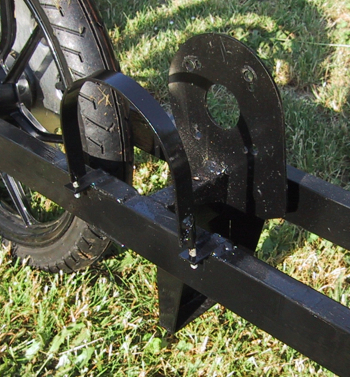 We have found a neat seat slider mechanism for the BugE that allows you to adjust the seat for different sized riders. Park Brake cable end fitting. If you carry hard items in the trunk, they will rattle around. A trunk pad will cushion these items and reduce the clatter. A piece of camper pad, carpet etc will work. When the rear wheel hits a bump it can move up to three inches to absorb the impact. 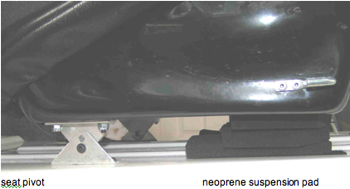 However, the seat can also get kicked up to an inch by the bump as well, especially if the seat is mounted further toward the rear.It you mount the front of the seat to a hinge pivot and support the rear of the seat with a two inch thick pad of neoprene foam, you can absorb much of the bump. Since the Fairing tilts forward for access, adjustments can be made to increase headroom for taller drivers Remember too that both the Fairing/Canopy and Seat/Fender will move independently with the suspension.Some states may require you to wear a helmet as well, requiring additional headroom.If you require more headroom after positioning the seat where you want it, ( horizontally and vertically) You may want the fairing to sit tilted up for additional clearance.If so, the foam rubber cushion strips should be attached to the top of the frame rails rather than the Fairing.Make some tapered wood strips to hold the faring at the desired height and screw and glue them to the bottom of the fairing flange that would normally sit on the frame. Paint or stain them to protect them. 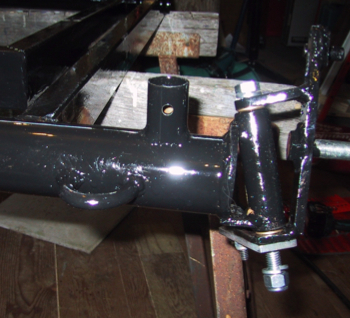 The Rubber hold down hooks, or latches will need to be spaced or positioned to accommodate the wedge spacer as well. If you have bad roads or rough railroad crossings etc, you will notice quite a bit of fairing shake. 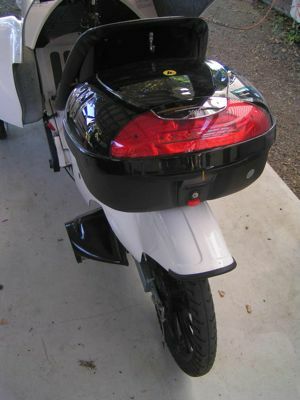 This is due to the fact that the Fairing is carried by the front axle and suspension and also because it is suspended on foam and can jiggle a bit. However there is some side to side flex in the fairing that can be reduced with a couple cross braces tying the fender well with the Instrument PanelThese can be made out of aluminum tubing or strap about 12 long bolted to the inner fender and lower lip of the I.P. The canopies used with the BugE are heated and then blow formed using a special Lucite Acrylic plastic into a carefully controlled vacuum chamber. The perimeter shape determines the shape of the curve and rise of the canopy  bubble However, variations in the plastic, heating, cooling, shrinkage, ambient temperature, humidity and operator skill all affect the sizing of the canopy.As a result each canopy may be slightly larger or smaller and optical qualities can vary. The process is both art and science.If your canopy fits loose, you can trim down the side to fit closer, or add foam rubber windshield gasketing to size the canopy. Rubber backed washers and mechanical fasteners should be used to secure the canopy to the fairing. 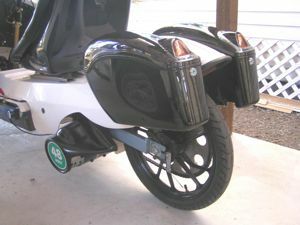 If the canopy is tight, trimming the front and rear portions can even out the fit.If you cut the canopy to make the rear portion removable, it also may help the canopy fit better, and make trimming easier. The manual photo and instructions were a little difficult for me to interpret so I took this photo. In addition because the 1/4" bolt was not threaded close enough to the head I could not use a nut on top of the arm as a spacer, I used two 6mm washers, they fit tighter to the 1/4" bolt and do not interfere with the rod end. E.G. I added tow loops on each side and a 1" receiver for an eventual top rack. My BugE will be open top and the fairing will not tilt forward. E.G.